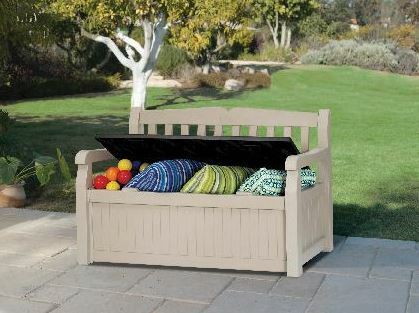 Ideal for those who want some stylish garden storage, the Keter Eden Garden Bench Box offers you a place to store a few garden items such as garden toys for the kids, a few random tools or maybe just a few pieces of gardening equipment. 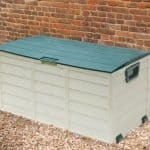 The space this offers is ideal for those who do not need a large amount of garden storage or even for those who just do not want a shed in their garden. This garden box also serves you well as a seat; a seat that is large enough to comfortably fit two adults. This is one very well made garden box. It is made with high quality polypropylene that is very strong. It is able to take anything the weather throws at it. Plus this is also very low maintenance and will require next to no upkeep from you. As well as being strong this is also one very secure place to keep your belongings safe. This is because this actually comes with a hasp and padlock so you can safely lock away your things. 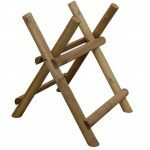 Most people will not even realise this is something that offers garden storage, as it really does look like it is just a garden bench. The Keter Eden Garden Bench Box is a great way to give yourself a little bit extra garden storage all the while giving you somewhere to sit. We see this as kind of a two for one type deal, where even if the stuff you put in here doesn’t get used for months on end, you still can make use of this as a seat. 4 feet 5 inches is the width and 1 foot 9 inches is the depth. The height of the box is 2 feet 8 inches. As far as storage space goes there is enough room in here for a few tools, basic gardening items and so on. Another way to look at this might be for garden storage for a few kids toys like balls, bats, skateboards and so on. When working as a seat, there is easily enough room for two adults to sit comfortably on here. As this is a seat it does not have a roof, so let’s just call it a lid. Any box that also serves as a seat has to make a bit of a compromise. You see, in an ideal world anything that offers garden storage should have a roof/lid that has a slope on it to help with rain drain off, but you really do not want a seat that is slanted do you? We feel that the box does kind of meet in the middle here and give you a lid that offers protection from the rain for the items in the box as well as offering a comfortable surface to sit on. The lid is actually very strong as it is made from high end polypropylene that is done in a smart brown colour which goes well with the rest of the box. The Keter Eden Garden Bench Box is made from polypropylene, which is a high end plastic material. We love this material as it is very strong and it also allows manufacturers to mould it in some creative ways. For example, here they have made some very practical armrests come out of the box for extra comfort. The walls are nice and thick and as polypropylene is so strong, we really do not see there being any issues at all with this. Like most other plastic based garden storage boxes, there is no actual frame inside of here. This is not a bad thing, though, as the way the box is made does not actually require a frame. It slots together strong enough so that it has a very robust feel to it and we are sure you will be impressed with how strong, but lightweight this box feels. Well, it is lightweight until you fill it with a bunch of tools or the kids garden toys. The bottom of the box is once again made with that polypropylene the rest of the box is. This is great as it is able to take quite a bit of punishment. So if you do use this as a place for the kids to keep their toys, it is able to take the abuse of them opening the lid and then throwing their stuff inside. Polypropylene is pretty much maintenance free. You have no treatment obligations here at all. If it does get dirty as the years go by, then cleaning it is as simple as giving it a good blast with the garden hose. Just make sure the box is fully closed before you do! The Keter Eden Garden Bench Box comes with a two year guarantee, which if we are honest is a little short. We feel that they easily could have given a five year guarantee with this garden box. As wem mentioned just before this box has a lid which serves as the door and the seat for this garden box. We really like the brown design of it and when fully closed you would not even know that it can be opened as it just looks like a garden seat. While the polypropylene is very strong and can easily take the weight of two adults, we would recommend that you think about adding some kind of outdoor, weatherproof cushions so it is more comfortable to sit on. When the lid is down and down properly, by this we mean not things spilling out the side, the box actually offers quite a bit of security. Add to this that they give you a hasp and padlock set with it and you have a very secure space to keep a few outdoor items safe and sound. This is one of the more private garden boxes that we have seen and the reason for this is that it really does not look like a storage box. It looks just like a garden seat, so most people, unless they actually knew, would just assume that this is for sitting on and have no idea that you have a whole load of cool items inside it. While we love the polypropylene that this is made from it really does not allow for any kind of customisation, we do feel that if you plan on regularly using this as a garden seat that you will want to buy some cushions. So that is a way that you could give it a little bit of your own personal style. No extras at all are offered with the Keter Eden Garden Bench Box. To be honest with you we are really not sure what they could offer as, apart from cushions, this comes with everything you need right out of the box. Polypropylene is awesome and it really is quite a high quality plastic. In general this whole garden box has a very high quality look to it. This is the kind of garden box that can easily give you 20 or more years of use. A very welcome bonus is the way the materials they have used are very low maintenance. 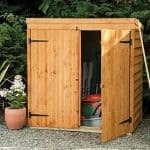 Clearly you are not getting as much storage space as you would with a shed here, but there is still enough room to keep a few tools and some garden toys. Also as a seat, it offers far more space than the pictures suggest. One of the best things about a box being made from polypropylene is that it makes the installation very easy. While we always recommend having someone to help with installation, with this box, you could probably do it all on your own and have no trouble at all. 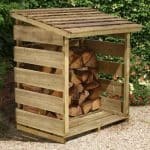 £99.99 for a garden seat is already a pretty decent deal, but when you add to this the fact it gives you some garden storage, then we do feel this is actually very good value for money. We really like the Keter Eden Garden Bench Box. We have seen a few garden boxes from Keter, but this one we feel has the best style. It really does have a smart look and you cannot tell that this is for garden storage. 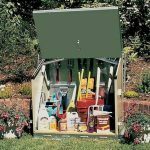 This makes it ideal for those who are not keen on having a shed in their garden or even those who do not need a whole lot of garden storage. The kind of plastic this is made from is great. It really does make this one of the most low maintenance garden boxes that you can get. 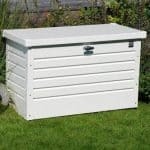 If a shed is not what you are after, but you still need that little bit of garden storage, then this is something that we highly recommend you take a closer look at.